Click on the thumbnail title pages below to download the entire presentation in Powerpoint format. Exploration clues from AEROMAGNETIC DATA - Are you missing them? Emphasises the need to take time to make careful geological observations and to zoom in to the most appropriate scales. It also touches on some ‘big picture’ targeting matters. Relates the progress from 1950s BMR 1mile line spacing data, through the Aerodata 200m phase of the 1980s to the current trend to ultra-detailed (down to 20m) aeromagnetic coverage. Highlights the value of revisiting ‘old’ geological mapping and integrating this with ‘new’ detailed aeromagnetics. It illustrates the Hallberg mapping at Menzies, Kalgoorlie and Coolgardie. Emphasises the time needed to recognise subtle structures that may be the clues that lead to discovery. Examples from both minerals and oil&gas exploration are presented. Highlights the leading role that geologists must take in order to effectively work with aeromagnetics, and emphasises the need to take time & care in observations. Illustrates the (largely qualitative) processes involved in interpreting aeromag in sedimentary basins. Includes examples from oil & gas (Amadeus Basin) and minerals (Galmoy, Ireland) exploration. This presentation by the late Prof. David Boyd at the Exploration ’07 Conference in Toronto gives his perspective on 40 years (since his landmark paper at the same conference in 1967) of exploration and discovery using aeromagnetics. Dave Isles co-authored the paper. This provides an example of aeromagnetic application in geological mapping designed to encourage geologists who have not used aeromagnetics to become aware and enthusiastic. 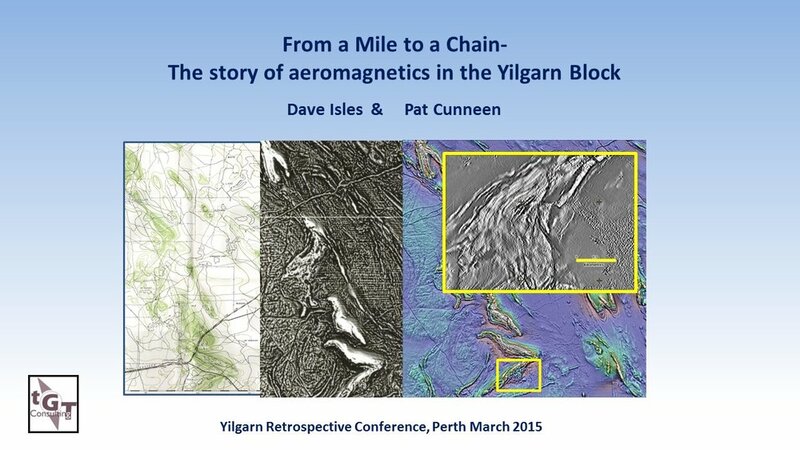 Aeromagnetics in the Yilgarn Goldfields - Sucked Lemon or Budding Rose? This talk was presented by Ken Witherly (Condor Consulting Inc.) at the Decennial Mineral Exploration Conference (DMEC) Workshop, 2017. DMEC was hosted at the Prospectors & Developers Association of Canada (PDAC) Convention, Toronto, Canada.